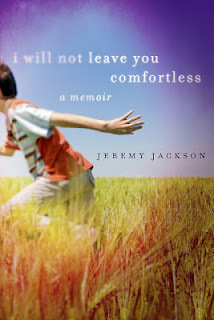 I am a sucker for a good memoir as we know, and I absolutely love Jeremy Jackson's writing, so when I heard he had a memoir coming out, I was chomping at the bit for months to get my hands on a copy! This is a memoir about Jeremy growing up in Western Missouri when he’s eleven, on a small farm (his parents both work; the farm is just for household consumption) with his two older sisters, and with his grandparents in the next town over. He's trying to navigate school and friendships and getting the coolest bike ever and girls and family. The story is fairly typical (which makes it very nostalgic for all readers, even ones who grew up in the suburbs of a neighboring state) but alongside all the ordinary things about 1984, Jeremy's grandmother doesn't feel well and has some strange and severe pains. While eleven-year-old Jeremy doesn't clue in to the ominous and alarming state of his grandmother until much later than the readers will, you almost hold you breath hoping he won't figure it out until later, to preserve a few more days of innocence. The book is very sweet without being saccharine, lyrical without being writerly, evocative and comforting. Mr. Jackson is one of those terrific writers who can take things I normally don't like (lyrical writing, short choppy sentences that are often fragments, repetition) and yet make it all into a book I love. That takes a truly masterful writer. The book is quiet, not action-packed, and nonetheless it's a very fast read. I particularly liked one chapter towards the end where he acknowledged that he's not just the main character but he's also the author, writing a memoir, which necessarily is missing parts and has other bits glossed over, and he wonders if those missed parts serve a purpose, if the reader would understand certain things better or worse if he'd told us details sooner. It was a very interesting acknowledgement of the necessity of an unreliable narrator in all memoirs (or at least a narrator not interested in telling everything) and the difficulty of writing memoirs generally. If you remember eating sweet corn in the summer and fishing in the creek and going camping with the Scouts and worrying if the girl you like will like you back, please take this lovely trip down memory lane. I promise, you won't regret it. I got this book free from the publisher, thank you. I look forward to reading this. I just read his Cornbread Book, and so enjoyed the book and his writing. Great personality that shines through his words. Thanks for this. I'm going to email my library and see if they will buy it.